Blueberries have a higher antioxidant capacity than any other fruit, earning them a place on your table and in your home garden. Blueberry bushes start with vessel-shaped flowers during the first part of spring and then form berries progressing in shades from green and pink to blue and purple. Since blueberries grow in clusters, not all of the berries will ripen at the same time. In fact, you can have one cluster containing both green and ripe fruit. Unlike some fruits, blueberries will not ripen after you pick them, so you must wait until the berries fully ripen before harvesting. 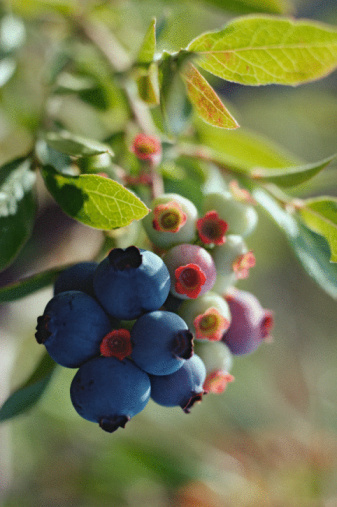 A blueberry cluster can contain both ripe and unripe berries. Examine the cluster of blueberries. The blueberries will be ripe when they are completely blue in color, from the stem end to the calyx end. The calyx is the outer cap of the blueberry opposite the stem. If the blueberries have green or red near the stem end, do not pick them yet. Press the blueberries between your fingers -- ripe blueberries feel firm to the touch, rather than soft or mushy. Taste your blueberries for ripeness. Ripe blueberries taste sweet; unripe blueberries will not have much flavor or sweetness. Harvest your blueberry bushes in the months of June through August, since blueberries ripen during this time. You will need to harvest the same bushes repeatedly since blueberries ripen in bursts. How Long Does a Jalapeno Plant Grow? When Do Wild Blackberries Ripen?